Just last night at my local bar I was asked what my favorite airplane was and nearly got punched when my answer was NOT the P-51 Mustang. Like any model builder, I like the Mustang, but other than a few racing variants I am not likely to ever build another.Too many much more intersting and worthy subjects await us out there in history land. The menu is vast, if you're willing to look around and do some research.In this case, google really IS your friend. 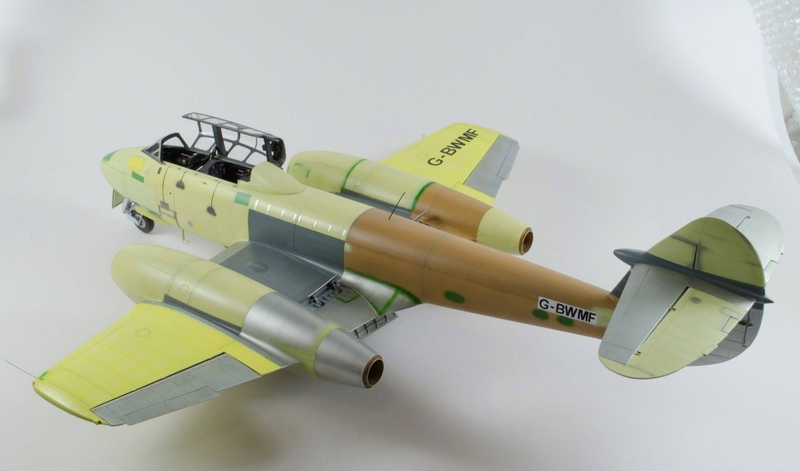 The model pictured above is a perfect example of what keeps me interested in this wonderful passtime.Built over in the UK by James Hatch, this is the Hong Kong Models Gloster Meteor F.4 plastic kit in 1/32 scale, converted to the two seat T.7 trainer using my resin conversion set available on this very website. Besides being an exquisite example of the model builders craft, this build is of a unique moment in the life of an historic aircraft, finally restored to flying status , but before the inevitable re-paint as a service machine. The finish, consisting of different types of primer and raw metal offers the builder a very challenging and eye-catching alternative to the usual stuff, and assures a model that will be an instant stand out on any contest table and in any display. You can't miss it. It will make you think. It certainly got me all fired up when I saw it. I've been lucky enough to be around a fair number of for-real aircrat assembly lines as well as warbird restorations, and there's no shortage of otherwise boring subjects from all eras of aviation ( and automotive ) history that could be built like the model above, somewhere along the way from a pile of bits to flight...Maybe even a Mustang! The building outside the box and making the perfect airplane was and nearly got punched when my answers. We all are getting here top essaywriter the model builders craft, this build is of a unique moment service machine. My dad built model airplanes when I was a kid. Technically he still does but I'm not there to witness it anymore. :) Now my wife and I are Warsaw Indiana Realtors and we don't have the time for hobbies. I've always thought model building was such a cool hobby, but its price has deterred me! Any cheap ways to get started? This seems like an awesome hobby! Very impressive. Wow. Really helpful. I was looking for post like this. This made my day actually. Thanks a lot. The concept and design for this plane is terrific. Submitted on Saturday, February 09, 2019 at 7:13:22 pm by Great! I really like this design - as a metal roofing contractor and a cpa, I really appreciate a good design. Thanks for sharing this! Wow this is really awesome! thanks for sharing your passion. Thank you and sorry that you lost your home and workshop. That's such a tragedy! I hope that you're able to bounce back quickly!